I've been getting a lot of e-mails lately asking about my life, and how I got started into photography. I have always been hesitant to talk about my life in depth because it's exposing things about yourself that only those who grew up with you know...and well, I get scared to share because you never know who's reading this blog of mine. But heck, I have a blog. I HAVE A BLOG. I have it for a reason, and that's to share my life in hopes to inspire YOU. Or make you laugh. Or just laugh at myself. Or cry. Oh...crying. It's good for the soul you know. To document, to write, to vent, to just...be. OH & the rambling...I do a lot of that...and well, I'm doing that now aren't I? This is a place I feel that I can do that one thing that I want in life. Today is the day I share a little LOT more about myself on my blog to give you a little background. I haven't ever really gone into depth about my upbringing or really even given you any substance to my posts. I've skimmed the surface about starting a business and probably have a thousand posts talking about how busy I am all the time. (Sorry about that.) What I'm here to do today is to "start" this little story of mine. We all have a story, and I'm slowly but surely realizing that my story needs to be shared. It's nothing CRAZY, but it's definitely one I want to share. Maybe you can learn from it. Maybe I can help you? Maybe I can inspire you? Or heck, maybe I can just give you some reading material for the next 10 minutes. Either way, I'm happy to tell you a little more about myself. I've realize that growing up, I've changed SO much. But the one thing that hasn't changed is my love and passion for being creative. "What is the one thing you want in life?" To help people. TO inspire someone, anyone. To change someone's life for the better. Y'all, that's all I want. That's it. Everything else I have is a bonus. I grew up in a town of 800 people. There was one blinking red light, two gas stations, one grocery store the size of a dime, a lot of cow pastures, and I went to a school where everyone knew EVERYONE. I grew up most of my life in a broken home that was only 50 yards behind a railroad track. My Dad lived with us for a little while, but was mostly absent for most of my life. He and my Mom fought a lot, and we were always paycheck to paycheck. We had food stamps. There was even a point where we were on welfare checks just to survive. We didn't live in a nice house. We actually lived in a duplex two houses down from my Mamaw and Papaw that was rent free because there was no way we could afford a REAL home. My Mamaw and Papaw inherited this duplex from my Great Aunt, whom died in this home (that's a story for a different day, but let's just say my friends didn't like to stay at my house because it was haunted! haha). Our duplex sat up on concrete blocks, and we had a screen door that squeaked every time you opened it. You walk in, there's the living room, then my a bedroom that wasn't really even separated from the living room or the kitchen. Door ways were the only thing that "separated" the rooms in the house and the bathroom was only big enough to stand in. Before my brother moved out and went to college, I shared a bedroom with my Mother, and my brother got the extra room that was right by the kitchen. We had a gas heater that we sat next to every night it got cold and slept in front of it most nights because it wasn't big enough to heat the whole house. The air conditioner stuck out of the wall, and it would break just about every summer. Again, it only got "cold" in the living room and wouldn't cool down any of the other rooms. My Mom drove a Hilton Oldsmobile (beauty at its finest). It was mint green, and it even had the Pine Tree Air Freshener hanging in the rearview mirror. I was embarrassed to drive around town in this car and dreaded it when I had friends over because my house was so different from all my other friends. It was small, old, and falling apart. I apologized for our car and our house to every friend that came over. I remember I had a girl come over once that I really liked and wanted to be her friend so badly, but after she got to my house, she called her Mom to come get her because she didn't like my house. I remember crying all night, and my Mom held me and cried with me. It makes me teary eyed just thinking about that. We couldn't help it. I went to a tiny small white church in town my whole life. Like, that little white church out in the middle of the country? That was where I went. My Mom raised me to be a believer, and I couldn't imagine believing anything else. Growing up, I was a pretty tough cookie. Emotional sometimes, but tough. I still managed to look past the "poor" and the "unfortunate" cards we were dealt, and wore my heart on my sleeve. I still managed to be happy. I wanted to be friends with everyone. I loved people! I had a desire to build relationships with people from a very young age. When my Dad left us, my Mom struggled to support my brother and I, but somehow, she managed. She gave my brother and I everything. When Tommy Hifiger was cool and all my friends had 5 different colored Tommy Hilfiger Shirts? She would save every penny to make sure I at least got ONE name brand shirt so I wouldn't have to feel like an outcast. And y'all...I wore the mess out of my Red Tommy Hilfiger shirt. Like, I wore it every single week to the point it turned light pink because I washed it so many times. 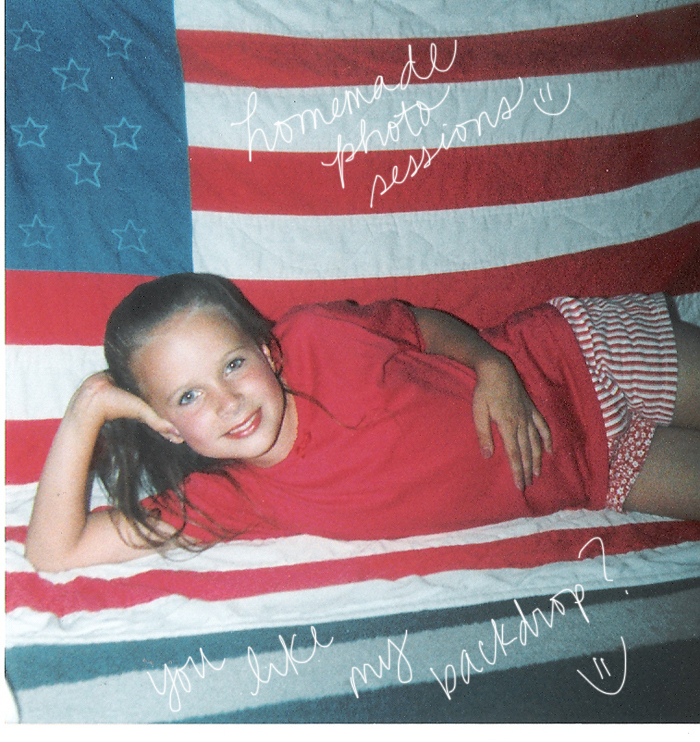 I had a lot of hand-me downs (holla!) and I embraced those clothes like I was on the runway! :) My Mom became my best friend through all of our struggles, because after my Dad left us...it was just my Mom, my brother, and me. After my brother went to college, it was just us two girls. 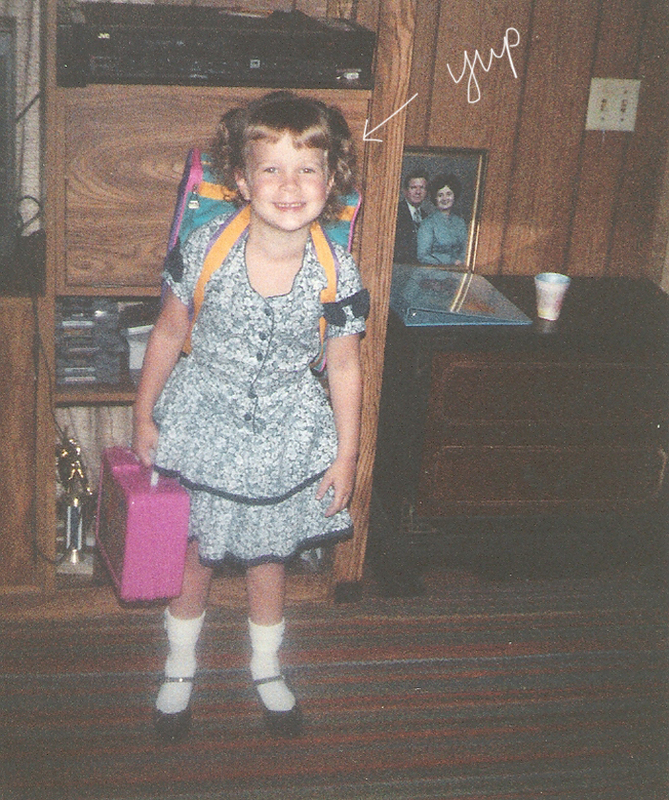 My Mom tried her best to make sure I had "cool" clothes and the "cool" supplies in school because she knew that mattered to me. My Mom? She always did without. She would make sure I got the name brand crayolas and not the cheap wax crayons that were $2.00 cheaper. She didn't want people to know how much we struggled. So appearance to her, was everything. She sewed A LOT of my outfits and made all of my halloween costumes. My Mom was so talented, and she never really knew it. She could turn the simplest things into something really COOL. Some people might say she spoiled me, but the only thing she spoiled me with was her time, her love, and her attention. That's more than any daughter could ever ask for. I may not have had a cookie cutter upbringing, but I honestly wouldn't trade it for the world. My Mom's vision for life, & her heart of gold was I guess, inherited to me down the line because my LOVE for life, people and creativity has always been there. She's always made me see the beauty in things, even when things weren't so beautiful. 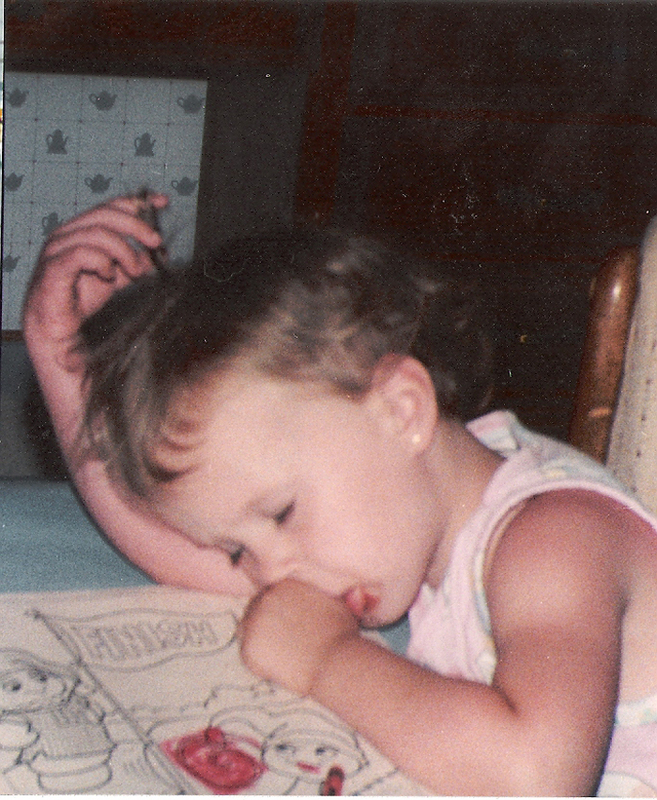 As a little girl, I'd fall asleep with colors in my hand. I drawled and colored ALL the time. I loved arts & crafts time. LOVED it. Math? Pshhh, PLEASE. Give me some colored pencils, markers and colors , please. English was okay too. I didn't mind writing. As I got into elementary school, the poster contests were my thing. If I didn't win them, I'd cry like a baby. I usually won them though, and it was more of a "I got first place, but I'm doing better next time" sort of mind set. I loved art in all forms. I danced for 8 years. Tap, Jazz & Ballet. 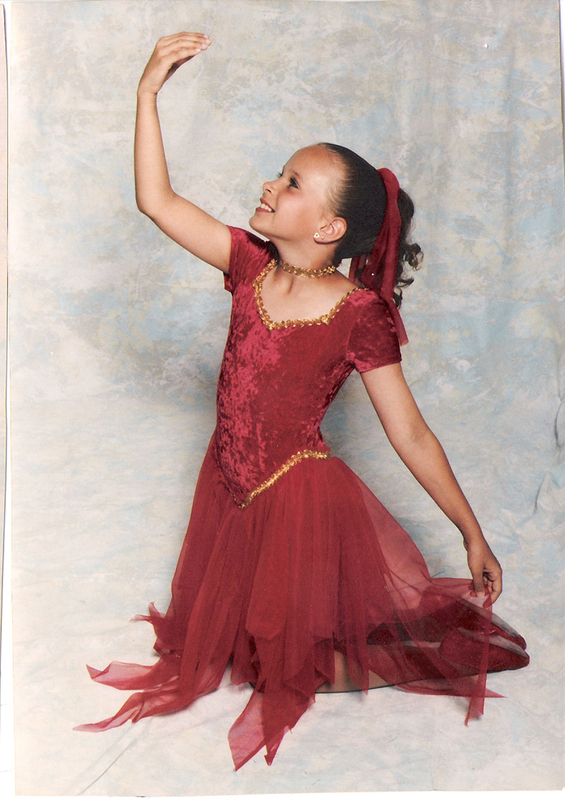 I loved dance. Mostly because I got to dance with my best friend, but shaking my tail feather to music...y'all...my soul was found out there in those dance conventions and school auditoriums. I loved to express myself in every artistic way that I knew how. I played softball, basketball, volleyball growing up. I loved me some sports and I still do. 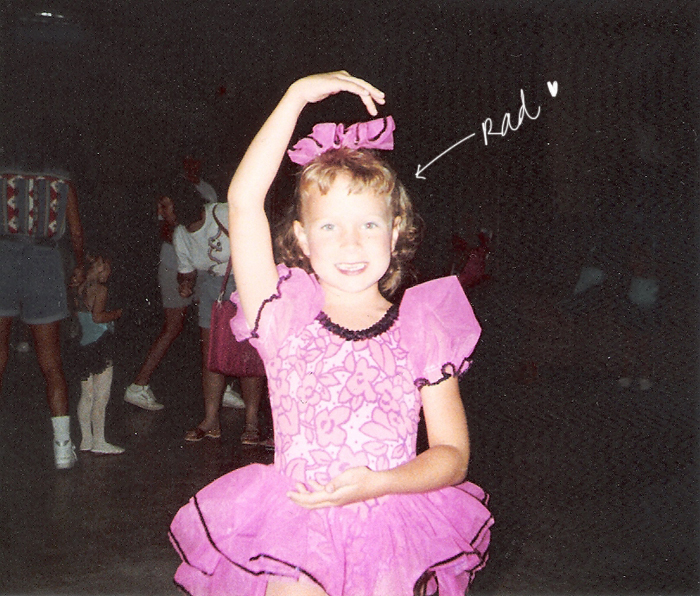 I entered my very first pageant with the push from one of my favorite teachers and fellow dance Moms. She took me into her home for a weekend, taught me how to walk, taught me how to interview...and Surprisingly, and by the grace of God... I walked away with the crown the very first pageant I was ever in. 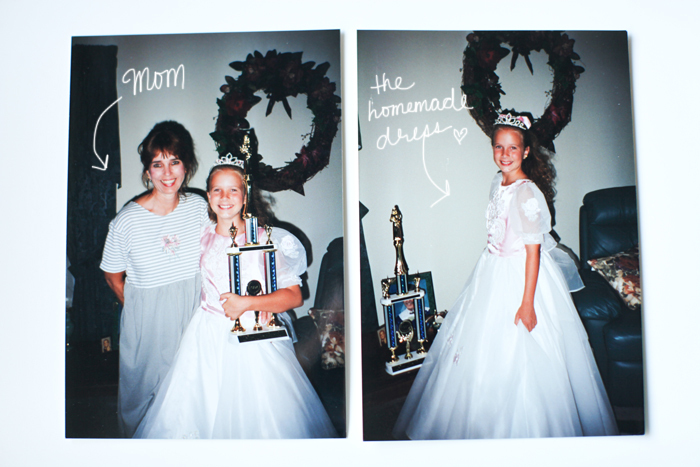 Granted, it was just a county pageant, but my Mom stayed up for THREE nights in a row to make me a pageant dress. She put her blood, sweat and tears into this dress. And the look on her face when I walked away with the crown that night? Priceless. 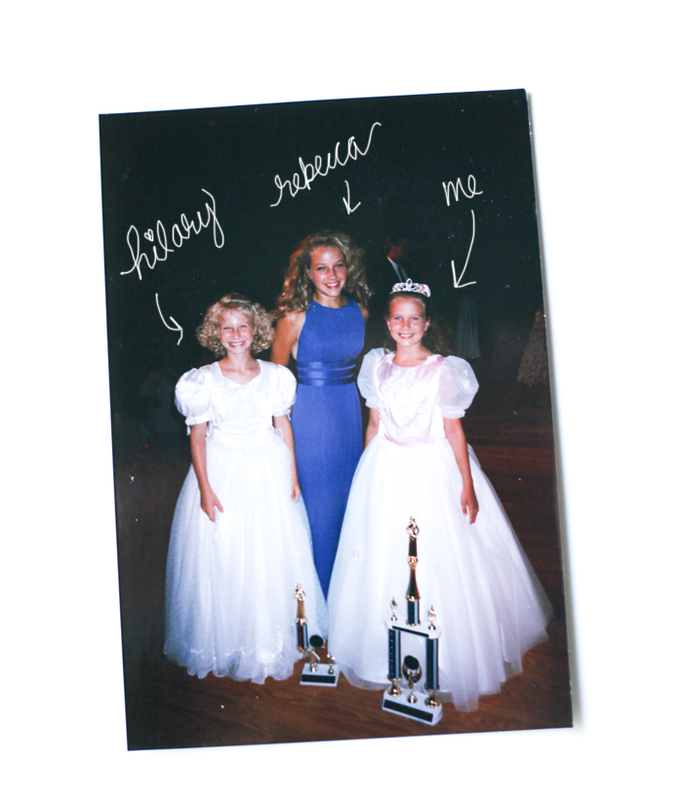 I also crowned by Rebecca Robinson, a girl I grew up dancing with, whom also later went on to be Miss Texas 2009. Pretty cool. 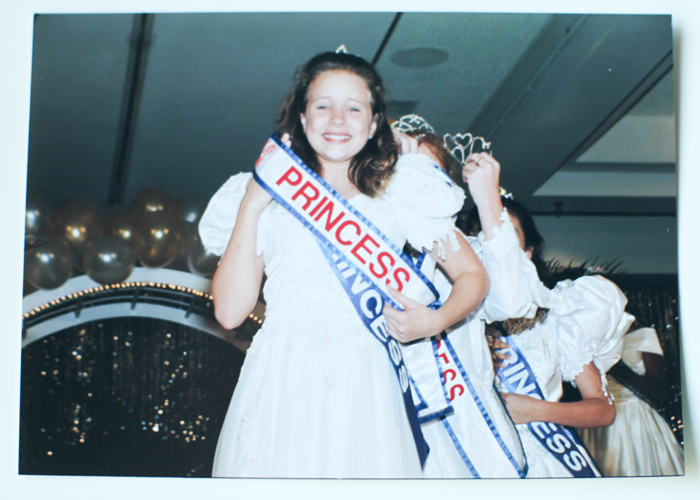 I entered a state pageant that spring (Miss National Pre-Teen Texas) and was #1 going into the top 10. I made the Top 10...and all I needed to do was ace my on-stage question. What did I do? I froze, and answered something to the sound of WORD VOMIT. I immediately remembering the anxiety I had when it was time for the on stage question. I could always answer it in my head, but my delivery? It sucked big ones. I ended up not making the top 5 (for good reason) and met the most amazing group of ladies. I later entered a couple of other state pageants and placed top 5 in all of them. I couldn't ever get my onstage question right. 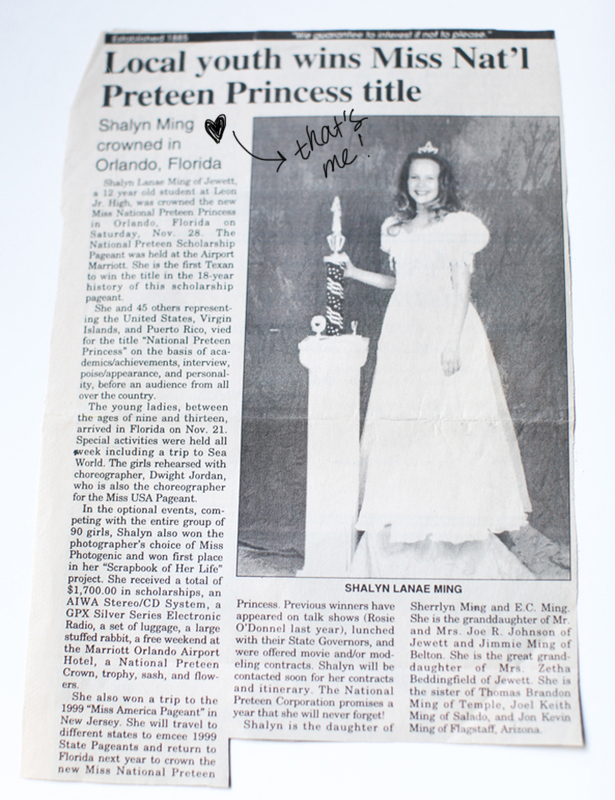 After making the top 10 in the Miss Texas National Pre-Teen Pageant (with my best friend, Hilary might I add), we were automatically qualified to compete in Orlando, Florida for the title of Miss National Pre-Teen Princess. Boy, were we excited! We were going to compete with all of the other top 10 contestants from every state. Talk about a total shot in the dark, right? I think the fact that we were going to be in Florida for a WHOLE week and got to go to Disneyland and SeaWorld during this trip was a WIN WIN situation for sure. Without going into too much detail (because this post is already REALLY long), this pageant was a HUGE, HUGE turning point in my life. I remember that week being one of the best of my life. I loved every minute of it. Meeting girls from other states (whom I still talk to to this day :)), competing in talent, sportswear, and evening gown. The thing about these pageants though...they were scholarship pageants. If you won, you won scholarship money to go towards college. Your grades mattered. Your interview mattered. Nobody really wore make-up. 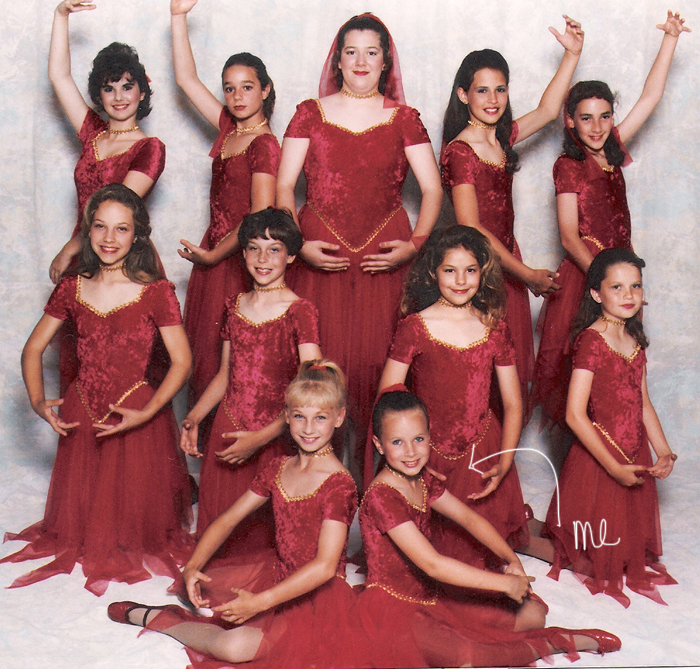 Trust me, this wasn't your typical Honey BooBoo Pageant. It was place for girls to connect at a young age, gain self confidence, and most of all, HAVE FUN. I remember the night before finals. It was Thanksgiving and my Mom said, "Shalyn, let's go to the bathroom before the line gets long." As WEIRD and ODD as this is...I went into my stall and I didn't even have to go to the bathroom. I had a moment to myself, on the toilet, lol, away from my hotel room, away from my Mom, away from my best friend...just a moment to myself. "God, if I could ever, ever ask anything from you in my entire, ENTIRE life...this would be it. I have never wanted to win a title more in my life. If I won, God, I would inspire these girls to be their best and I want to be a role model for them God, please God. This is my dream. I can do this." I then fake flushed my toilet and went about my evening with all the girls. The next day was finals. I was nervous, anxious and not confident. We did our opening numbers and then it was time to line up to call the Top 10. Name. Name. Name. Name. And our next contestant vying for the Title of Miss National Pre-Teen Princess IS....Shalyn Ming! (My maiden name) haha." Y'all. I about peed my pants right then and there. I walked up and stood in line and tried so hard to hold back the tears. They called us back into a room and had us sit there and wait to go on stage to do a final walk and then answer the dreaded...dare I say it...FINAL QUESTION. I couldn't see my Mom and have her calm me down. I hated the final question. I knew I was going to blow it at Nationals and I had no way to prevent it, I thought! Then it was my turn. I literally remember turning around this plant on stage and just holding back tears. I couldn't believe I made the Top 10 at Nationals. ME? ME!? This was such a big deal to me, y'all. I could feel that lump in my throat and I tried desperately to hold it back. "Hi Shalyn, How are you doing?" "Now Shalyn I have a question for you, are you ready!?" "Yes sir (Lump was getting bigger)"
"Shalyn, if you could be any age...what age would YOU be...and WHY?" "(Insert quivery voice)If I could be any age, I'd be the age I'm at now, which is age 12...because I'm having THE TIME OF MY LIFE!" The crowd went silent and then everyone clapped and cheered. Towards the end of my answer I thought, WHOA. I didn't blow it. I didn't blow it!? We then had to wait for all the state queens to go (the 1st place winners from all the states that were in a different division) and finally it was time to call the winners. FROM THE STATE OF TEXASSSS, SHALYN MING!" I totally had a pageant moment y'all. AND they're real. Yes, the tears are real. Make fun of me all you want! :) HAHA. This moment meant so much to me as corny as this all is. It was a big deal for a 12 year old okay? :) I worked hard in school so I'd have good grades for these pageants. I stayed polite to every girl there that weekend and stayed true to myself. I never compared myself, and I genuinely was just happy to be there. After that night, my life changed forever. I got to go to watch THE Miss America Pageant in Atlantic City, New Jersey and meet ALL of the Miss America's. I traveled that WHOLE summer to 8 different states emceeing state pageants, helping lead the girls, talking to the girls, and more or less, being a role model. 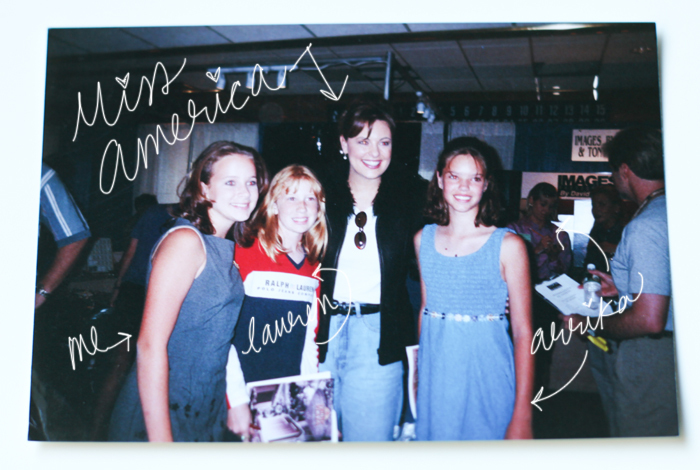 I met so many wonderful, talented, and beautiful girls who all grew up to go on to Miss America, AND Miss USA. I've probably seen 20 girls that I competed with in dance or in pageants grow up to either BE Miss America, Miss USA, or became a closer runner-up. Do you know how awesome it is to see these girls going for their dreams? 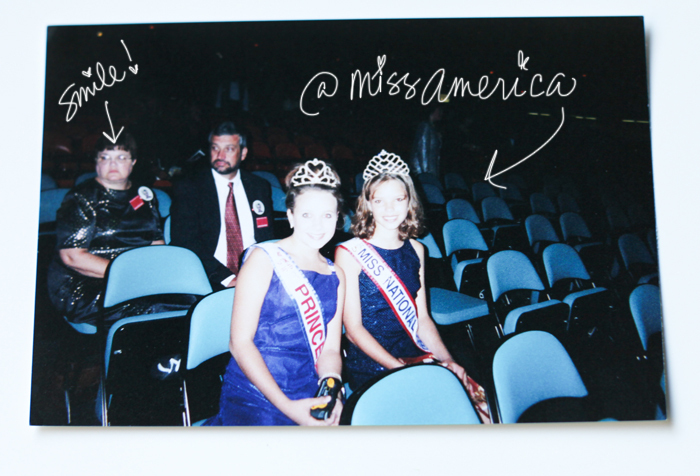 I too wanted to grow up to be Miss America, but that never happened for me. My mamaw would constantly remind me when she would see me that I could have gone all the way, and would tell me how disappointed she was that I never went for it. At the age of 13-14 my body changed. I was a late bloomer, but when I bloomed, boy...I BLOOMED. I got really insecure. My new "womanly" figure wasn't growing into me. It just came overnight and took over world and took any self esteem I had. I thought I was fat, and I really struggled with my self image. I went from one of the smallest girls in the school, to one of the chubbier girls. I ate right, I was active, but my body thought otherwise. My Mom and I moved to Northern California in the 8th grade and I endured complete culture shock. I got made fun of my girls because I was "nice", I had an "accent" and because I wore skirts and dresses. However, as time told, people got to know me and realized I was in fact genuine. I made friends, still made good grades, had good relationships with my teachers, I was involved in student council, prom and homecoming committees, volleyball, softball, basketball, and I was even Homecoming Queen. I did okay. I did, but I fell out of love with who I was physically and drowned myself in feeling sorry for the way I started to look. I constantly struggled with my appearance and self esteem even though I probably fooled a lot of people. My senior year of high school, I signed up for my next pageant. I wanted to dive in that world again, but sadly, the system had changed dramatically. It wasn't really about your grades as much. I mean it was, but you had to be a barbie doll. 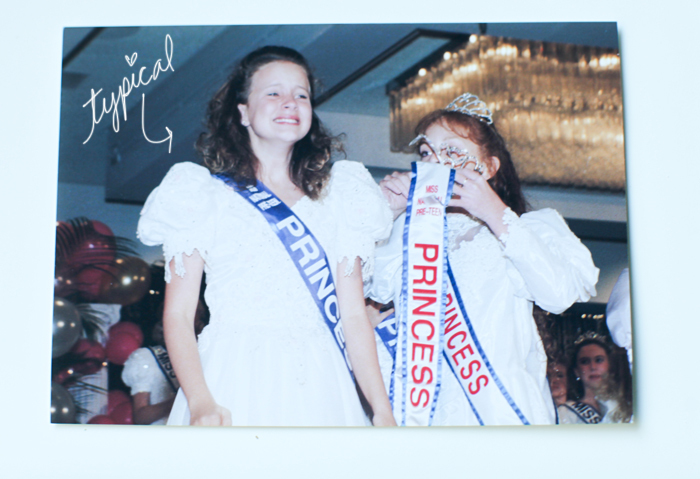 I still went for it, and drove down to Los Angeles with my Mom to compete for the Miss Teenage California title. It was a long weekend, and I felt out of place the whole time. I remember constantly comparing my body to other girls and I guess my lack of self esteem was evident. The thing I realized that weekend was that I had a lot of work to do on myself. Where was this girl that wanted to help others? I lost my passion to help. I was a lost soul going through the motions of high school and putting a smile on my face. I had a lot of friends and I was involved in everything, but inside, I felt defeated. I constantly competed with myself and kept telling myself that I wasn't enough. I felt kind of like I had lived up to my potential. "What was my purpose in life?" I even at one point wanted to be an actress...and I even went to a couple of auditions...but they must have seen the lack of confidence there too that I so desperately had forgotten. I got a couple of call backs but in the end, it never really went past that. After graduating high school, I moved back to Texas. I went to Sam Houston State University, and slowly, but surely, I found myself again. Sure, I had weight struggles, and I switched my major halfway through college because I finally figured out that I had to do what I loved. I stopped feeling sorry for myself and decided to make a change in my life. It was time I slapped myself in the face and lived a beautiful life, no matter what obstacles were in front of me. In college, I met Andrew (DDHP) and he too dealt with my insecurities. I even went through a time where I felt like he was TOO good for me. I would tell him that he needed to find someone who was pretty and skinny and he basically just looked at me like I was on crack or something. That boy loved me for me. Even through weight gain. Even through my PMS. He told me he loved my heart and that was what did it for him. He had never in his life met someone who valued relationships, love, and people the way I did. I never, ever saw this, but he did. All this time, I spent feeling down on myself, he was there to remind me that I was enough and more. He made me realize that I had something to offer, and that was my heart. We later got engaged (HOLLA! ), and I graduated in August of 2008. He still had a semester at Texas A&M, so I moved to College Station to work until we got married in March. I had to find a job, and well, wedding planning was a blast. I KNEW I loved the weddings. And along this entire story I just told you...well, I had about a million little plastic kodak cameras to capture every single moment. I found JOY in life and I wanted to take pictures every second I could. I was always THAT girl that ALWAYS had a camera. I'd use my allowance ($5.00 to $10.00) to buy a disposable camera and then wait to develop the film as soon as I got my next allowance. It was a repetitive cycle. I took pictures of my friends and would have them over ALL the time to do "Glamour Shots." I'd do their hair and make-up and then take them outside to take pictures by the tree in our backyard. I was THAT professional, y'all! We couldn't wait to ride our bikes down to the pharmacy (where my Mom also worked) to see if the mail guy had dropped off the prints. We were impatient what can I say? :) When I graduated high school, I won a digital camera at Project Graduation. My step-dad at the time had also bought me my first Fujifilm Digital camera, and boy was it COOL! I took pictures like it was going out of business. People got annoyed all the time, but did I care? Not one bit. During my time in College Station, I had seen a bridal magazine at one of the little wedding shops in downtown Bryan, Texas. I needed a job BAD and so I called up the lady that was listed in the magazine as the Regional Advertiser. She was pleasantly impressed that I had just picked up a magazine, called her and asked for a job. I did. I called her up, met up with the president of the magazine at a bridal show, and got the job. 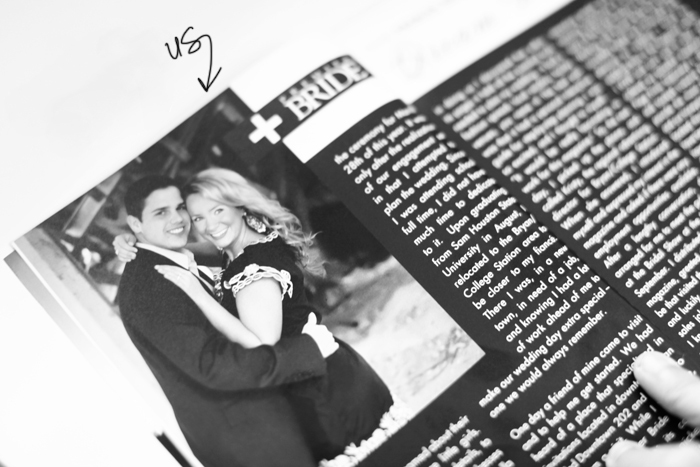 I was a Regional Director for a bridal magazine. How cool was that job for just being out of college? They even let me talk about our story in the magazine too, which to me, was really cool! The only downfall? It was right when the economy SANK and NOBODY wanted to buy anything. I spent HOURS AND HOURS a day trying to sell a magazine that nobody wanted to buy. If I didn't sell a magazine...then guess what? I didn't make any money. It was all sales commission. SO, since I had only made $900 in 6 months (I'm not lying...you read that right), I had to find a way to make some money on the side. Fortunately, I found a job with a creative company that branded businesses. I was her assistant and handled e-mails and such, and it was a cool job. But, then I got married (with the help of my pageant scholarship money! ), and Drew and I got back from our honeymoon and moved to Austin to start our lives. When I got to Austin, I looked for a job for THREE months. During this time, my beautiful niece had asked me to take her senior portraits (DUH!) and after my first official photoshoot...I walked away feeling like I had found my passion...like a new person. Shalyn...WHY are you just now figuring this out!? I had mentioned the photography business about a year before we got married, but it was just a thought. I was scared and I wasn't confident enough to know if this was what I'd be good at. I continued to work for the marketing company, but quickly learned that photography & being in the creative business was where my passion was. If you've read this far...thank you. I know it's rather lengthy, but I just basically covered 23 years of my life. Not ALL of it, bc I left some out for the sake of privacy, but I feel pretty exposed today. And, guess what? It kinda feels good. 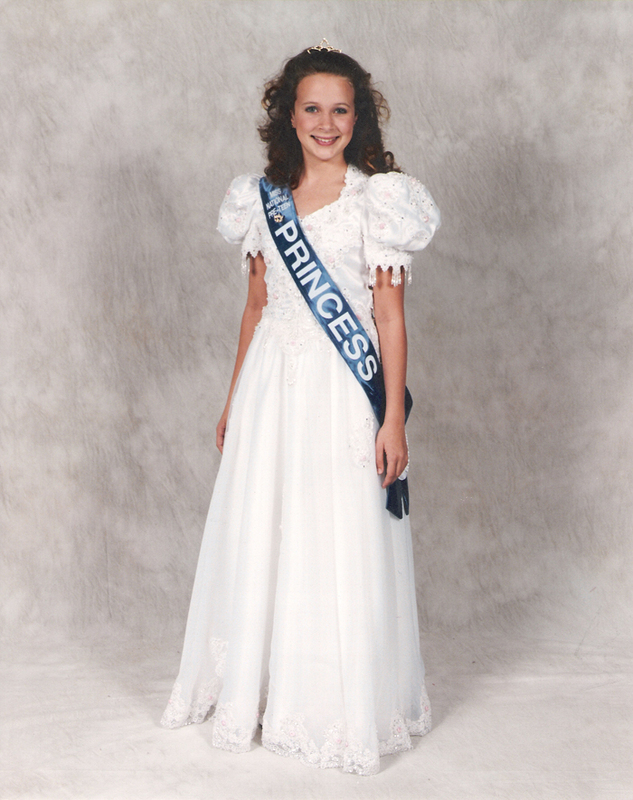 I just felt like sharing a bit of my past with y'all...bad hair, puffy sleeves, and all. I will be back soon to talk about Part II which will address my leap of faith, learning to believe in myself again, and of course, getting "started" into the photography world. Amazing! :) I can't wait to hear about your leap of faith because I am in pretty desperate need for that right now. OMG Shay... tears! This pulled at my heart string x1000... our upbringing was VERY similar... Can't wait to hear part II and thanks for sharing!!!! I am so inspired by you Shay. Thanks for sharing that beautiful heart of yours here today. LOVE you even more now. as if that was possible! Seeing the pictures from when you won brought tears to my eyes! Those images captured SO much. Reading your story is really telling of the passion and heart you have. Thanks for sharing. You're seriously SO beautiful inside and out! Honestly you're one of my very favorite blogs to read and follow! Such an inspiration! You let nothing get in your way even through the hardships! God shines through you and it's easy to see! Loved reading about your life and past experiences! OMG I didn't get QUITE through reading all of this (duty calls...) but Shay!! I had no idea I was friends with future Miss AMerica??!! I mean, I guess I should have known that but still!! I didn't know you were a pageant girl!! Aww!! I just love you so much! I love your story...love your life...love all the ups and downs...love your honesty. You are truly an insiration to us all so that dream you spoke of at the beginning, (To help people. TO inspire someone, anyone. To change someone's life for the better. ) well...consider your job done. ;) No. REally. Love you girly!! big BIG kisses from H-town! I just want to give you a big hug after reading this. Your heart shines through every post that you write, but I think writing this and allowing yourself to be raw and real with your readers just made your heart and your kind spirit even more evident. You really are an inspiration. You work hard and you love hard and that truly shows through your words. Thanks for sharing your story with us, can't wait to read the rest! wow sister you radiate happiness, the power of a woman, and extreme confidence. go you!! i too was raised by a single mother. my mom and my two sisters, four girls. i too remember the 'being embarrassed' moments, but looking back now, they made me who i am and i wouldn't change it for the world!! have a great day! can't wait to read the rest! I haven't commented on your blog before, but I do read it all the time. Thanks for sharing! Your story is truly inspirational and I can tell that you genuinely have a great heart! You're so inspiring and you're such an awesome photographer. Your story is amazing (and your mom is too!). I've always seen your beauty on the outside, but girl I definitely see it on the inside now!! What a story. I just spent my lunch hour reading it (with a few business interruptions). Thank you for sharing your story. You are an inspiration to every girl out there. LOVE this post! I already love ya, but this just reminded me why I think you're so great. :) So fun seeing sweet little Shay and hearing more about your story. I'm so happy you got your confidence back and found your passion in life...I know you're going to go FAR! You are SO talented and I can't wait to see what you do with all of those talents. 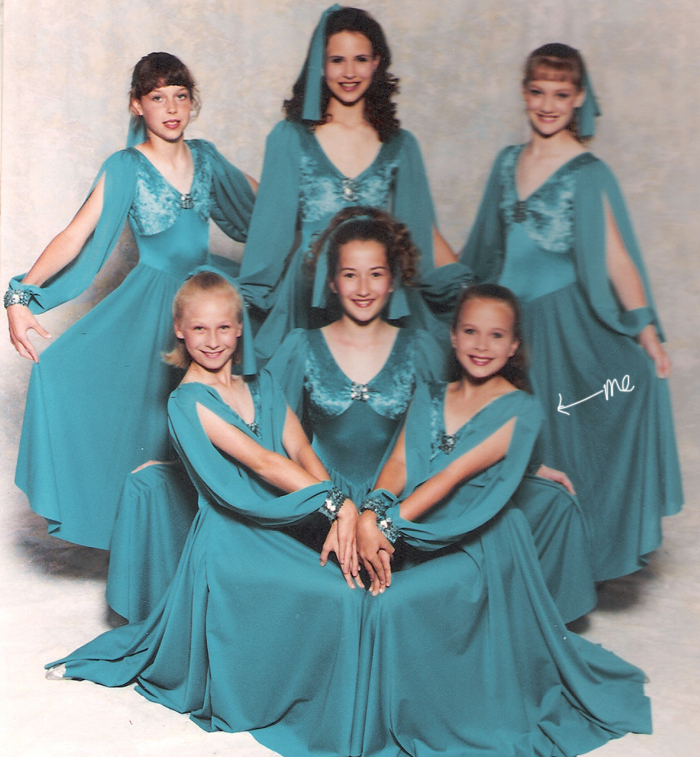 PS~ I got so excited seeing your old dance pics, makes me miss the dance days! I actually danced all the way through college (minored in it at KU). omgosh shay you are such an inspiring person and I THANK GOD i have someone like you in my life. SERIOUSLY! i read through this with tears in my eyes and litereally laughed out loud when you said "we later got engaged (HOLLA!)" haha because i can so picture you just sayin HOLLA! LOVE you more than words can explain and i know you've gone through a LOT but you are such a strong person and an amazing friend! I dont know what I'd do without you! AND i think its so cool to see Arikka in these pics!!! YOU ARE GORGEOUS! and im loving the red outfit! and the one of you crying when you won! haha so flippin cute! cant wait for part 2! i hope it involves meeting me ;-) haha KIDDDING!! I'm sitting here at lunch with my co-workers and I literally just ignored them for 10 minutes to read this. You are one amazing lady! Thank you for sharing a piece of your life with us - I love learning more about my favorite bloggers! I think you take beautiful pictures and photography is most definitely your calling! Shay, my dear, I feel so blessed to have gotten to know you when you were young and see the determination you had during the pageant we did together (btw, thanks for the TERRIBLE picture...) and see it translate into the inspiration you are today. You have always been set apart in my mind and, out of all the girls I met during those pageant years, the one who stood out as an admirable person and ultimately made me strive harder to be the same. Thank you for sharing your heart here. You have such a beautiful story (flaws and all) and the Lord's faithfulness has been and will continue to be so evident in your life. I've read your blog for a while under the radar but today I'm commenting because your post moved me! I work day in and day out with women who work so hard to get their lives on track following hardships and your story has inspired me to be positive about my hard work, even on the days when it's tough. I appreciate you sharing this beautiful story. You're an inspiration! This is such a great story! Just in reading your blog you can just TELL that you have such a heart for people! I am so glad that you overcame your struggles and are blessed with a great husband and finally your dream job! You definitely deserve it! What a beautiful story and I envy you for telling of the times in your past that wasn't so "beautiful" if you will. I have to admit I teared up at the part of the girl calling her mom to come and get her due to your house. You are so beautiful inside and out!!! Thanks for sharing! It's comforting to know that not everyone has the perfect upbringing. This is my first comment on your blog but love reading it! You're an amazing photographer too! you are so inspiring Shay. thank you so much for sharing a more about yourself today. i think it explains so much of why you are who you are and so thankful and grateful for everything around you. i love your heart so much. also helps that i think you are one of the most beautiful people i've ever "met". Thank you so much for sharing your story, Shay! Your passion and genuine personality really shine through in your pictures and words. I would have never known you came from the place you did. It makes me love you even more!! What a great story! I am a firm believer that everything happens for a reason, sounds so cliche, but is so true. With every tear, comes a smile, and with every hardship comes a lesson, and it molds us into who we are! Good luck with your business you are very talented and just through your writing I can tell you are such an amazing friend, wife, daughter, and sister! : ) Can't wait for part 2! You are SO inspiring! I love how you radiate happiness even when talking about hard times. It's that spirit that shows how truly amazing of a person you are. Your blog is one of my favorites to read. I respected you & looked up to you before, but I do even more now after you shared your story! You are amazing! What a beautiful post, so incredibly inspirational as well. The honesty and openness you put into writing about your life is refreshing to read. Truly think this post will inspire a lot of people. Thanks for sharing, look forward to reading more! Beautiful. It's amazing to hear about someone else's life experiences. Thank you for being willing to open yourself so much to your readers. I love that you found your passion. You make me motivated to find mine! Beautiful writing and I loved your story. I've been reading your blog for a few years now...but this may just be my first comment. Thank you for sharing this personal side. I had tears in my eyes as I connected with your stories in some way. I've been a reader for quite some time but this is my first time commenting. You are one of my must read blogs every day. You are always so positive, honest, and fun. Thank you so much for sharing your story. You really can tell through your writing and photos that you are a beautiful woman inside and out. Congratulations on your fulfilling your dreams... You truly deserve all the best! *tear* yes I read this all and yes I'm now sitting at my work desk with tears! Gosh, the first part of this post hit so close to home. I had THE very same situation you did. We lived in a duplex, I shared a room with my mom, while my brother had his own room. It was a very rough time, so I know where you're coming from. My mom would do everything she could do to make me fit in just like yours did. Wow. Your story is amazing and inspiring. Thanks for proving to others that you can start out with struggles and come out above. I can't wait to read part II. You are such a beautiful woman of God, Shalyn! I love your heart just from reading your blog & seeing your posts via social media..
Keep it up, girl. God IS and WILL use you. Rock it out, girl. You're awesome. Shalyn I think your incredibly inspiring and talented. You have worked hard and it shows and your strangth is truly inspiring as well. I've said it before but I hope to know the kind of love you and Drew share. Can't wait for the next chapter of your story. Thanks for sharing. the more i get to know about you....the more and more i think of you. you are one of the sweetest, most beautiful, funny, inspiring people i know....wish we lived down the street so i could bop on over, hug you and dance around your living room singing Call me maybe with piper, furlee and DDHP! Holy moly woman! I admire you so much for sharing so much personal information and really putting it all out there, it couldn't have been easy. It's very easy to tell (from reading your blog) that creativity is what makes you happy and you SHINE at what you do. I can't wait to read more and learn more about YOU. from the moment we "met", you have done nothing but inspire the HELL out of me. thank you for the that. I admire your spirit, your determination, your contagious sweetness, and your beautiful heart. you bring true joy to the world, and we need more people like that. so glad you're sharing your story - and your talent - with all of us. I loved reading this (yes, I read the ENTIRE THING) and I love your little puffy-sleeved, bad hair self! Of COURSE you were a beauty queen- you are gorgeous! I just sat here and read every single word that you wrote. I teared up at times and smiled big at others... Honey, you have had quite a life! It seems that there were so many times when you just couldn't catch a break... and then you would, catch that break... and it made all of the struggle worth it. I pray nothing more then for you to find contentment and peace... and maybe a yar of pure, simple bliss!! You are amazing. I think every comment above mine indicates that as well. First of all, I'm so glad that you shared your story :) I find it fascinating! You are SUCH a beautiful and bright light in this world, Shalyn! To see the struggles you've faced and how you've overcome them is so inspiring. You are absolutely, 100% changing the world just by being you! I just stumbled across your blog yesterday and I'm officially addicted. I loved reading about your background and how you came to find that photography was your passion and your career choice. I'm a photographer myself (sadly only part time right now) but I LOVE reading and hearing other peoples' journey's on how they got started and where they came from. Okay so I am about two years behind this story but I absolutely LOVED it! Your work is incredible and so inspiring. I find myself scouring your instagram when I need a boost or some extra inspiration for the day!